Taking a Ride on the Learning Curve. My subconscious may be better than I am? Continuing to play "page 2" even when I forgot to turn the page. In both cases I'm OK with the music even if there is the tendency to improvise. And, I've heard the music under normal circumstances before. All this describes a really trivial happening in the world of music BUT, BUT, a few years ago I could not have come close to the same performance !! I did NOTHING to make this happen except for my frequent exposure to things musical. Some subconscious activity was going on. I wonder what is next? I think that the good news is there may be good things happening just hidden by the routine struggles. Hang tough and welcome your surprises! Nice to hear your progress. I like the "take a ride on the learning curve" topic. Nicely worded. I have glimmers like that. I would say for me it is when I loose my place on the sheet music, and can just find the notes with my muscle memory. I would like to say ear.. but I don't think that is the case. Good news for you Oliver. "hang tough and welcome your surprises." I like that too! Don't be too surprised if ear playing is next. It starts with "memorization". That means that instead of translating the dots into fingerings, you are translating your memory of the sounds of the tune into fingerings. I'm guessing you may be seeing a glimmering edge of a gold nugget, so to speak. You have to dig at it to get it out of the ground. I mean I think you have a hint of your ear playing ability, but you would have to do some work to develop it. Don't assume that it's mysterious or unattainable. Would you believe you would be able to play simple tunes the first time, just by recalling the sound of the tunes, about as easily as you would sing or hum or whistle them? I didn't expect I would be able to do that, but it happened the first time about five months into my playing. One good move toward ear playing is to deliberately "memorize" simple melodies that you have learned from sheet. But I think it's even better to choose simple tunes and sound them out on the fingerboard. You find the letter names of all the notes used in a tune, by matching them on the fingerboard or singing them into a tuner. That way you know the key signature of the tune. Then you just plod through the tune repeatedly until you can play it nicely. Like most skills, it gets easier the more times you do it. If you keep learning simple tunes by ear, say ten or twenty of them, you are well on your way to fluency. I will certainly watch for any changes/progress in the future. I have a totally unfounded theory that we violinists eventually learn new scales, that being scales in 5ths. For instance, knowing that G is just up from C is very useful info, etc. I suspect that this sort of written and audible info has a lot to do with navigating the finger board. Great achievements come through persistence. Playing by ear is a simple task, if you know the tune, as RosinedUp says. 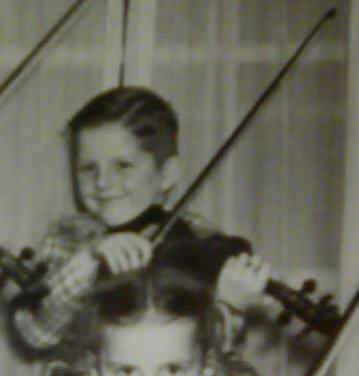 I stopped using sheet music when I had to quit playing violin at age 10, do to the fact that my mom couldn't afford lesson's or violin rental any longer. I did, (however) use sheet music when I taught myself to play the organ when I was 15 and used sheet music when I learned to play piano at age 51, but mostly for the past 60+ years I've played violin and guitar by ear. Playing songs from the past, songs that can be sung to and songs that much of the new generation have never heard of. In fact, I play a few songs that I remember from my past that I don't even know their names. If you can learn one whole tune by ear, and play it well, then you know you have the ability. No surprise---I think most people can do it. And what you can do once, you can do again, faster, more easily, and better. Although the skill doesn't exactly drop in your lap, it's not that hard to learn, and there's no real magic in it. I think of ear playing as a basic way of processing music. Anyone can repeat a simple sentence that is said to them. With some practice, most can learn to quickly repeat a simple musical phrase. To my taste, that ought to be a fun thing. My guess is that ear playing isn't taught much in school mainly because it doesn't fit the school band/orchestra model very well. Especially in a classroom sort of situation, ear playing would be harder to grade than how well a student followed a written score. For the same reason, improvisation is rarely actually taught in classrooms or even most private lessons. The evaluation would have to be more complex to be at all useful or fair, and it would require more attention and ability from the teacher than how well a pre-written piece is adhered to. So even though musicians will generally find considerably more positions available in jams, bands and combos where ear playing and improvisation are beneficial skills, the current way music is usually taught in schools doesn't do very well at preparing students for those opportunities. Considering the meager amounts usually allowed for music dept budgets, I don't find it surprising that they will likely fall short of realistic needs for the majority of the students, if they actually head into musical careers. Even if the teachers are highly educated and motivated, they can only do so much with the little bit they are given to work with, *and* they have to grade the students in a fashion that will fit on the report card like a history, science or math grade does. It is just not an optimal way to teach music, but it is what is most often available. In your experience do you know musicians that can play more complex classical or orchestra songs by ear exclusively? I mean I know you can, but is that how you usually play a new classical piece. You just listen to it and then play by ear? I am always curious as to how people tackle music. I play with a lady who has been playing for about 25 years. And she can of course just jump in simple songs with me and play along. But her songs that she is playing classical.. Partia N. 3 Gavotte en rondeau, Gravel Road (The Village), or Annunciation, she has the sheet music up and plays with sheet. (even though I know a few of them she has almost memorized). Maybe that is just her habit from being in youth orchestras and college? I am thinking/wondering.... After one has played for so long, I guess for more advanced pieces if one is looking to play them according to how they were written, then it is usually by sheet 1. for reference as many are long, and 2. So that when jammin' we can play the same arrangement. 3. after years of playing maybe one doesn't commit every long piece to memory. Just curious. Not knocking ear playing. I think it is obviously how a musician should be able to play music...USE THOSE EARS. Never met a professional classical musician that played exclusively by ear. I wish I had that talent. I can listen to a piece if it's simple enough and play it by ear but complicated difficult pieces I must learn using the music. I can read music better than most people can read their own language. Just put the music in front of me and I'll play it. Fortunately, I have a good ear and can play most of what I can imagine or sing without having to give it much thought. The bigger problem is knowing the piece correctly by memory..... I know many pieces partly but not completely. You know how you can sometimes come up with parts of a piece but not what comes next. When it comes to my work, performing, I'm fortunate enough to be able to use sheet music to cheat. I also have a fairly easy time memorizing music. It's all very normal for a standard classical musician. I'm glad that she is there for you. Are you taking lessons from her? You pretty much got it but the truth is that most classical musicians don't memorize anything. They just study and perform the works right off the music. A great musician makes great music. To justify themselves, school music programs have to put their results on display. The parents are not going to sit through fifty solos in an evening---witness the thread here about a month ago from a parent upset about their child's recital piece being abridged. Neither do they want to sit through the performances of ten small combos, even if the music teacher(s) had the time and energy to supervise all of that. It seems that a band or orchestra is the efficient way to demonstrate results. Someone who can't read music is pretty much useless to a large school band or orchestra. A student starts at the bottom, playing the 2nd, 3rd, or 4th parts, which only rarely carry the melody. A part without the melody is hard to remember, even if one can obtain a recording of it. Even one who can very easily learn a part by ear cannot be a leader on that skill alone, as they cannot be the first to learn an unfamiliar piece. A sight reader is ready to play now. A student who can play by ear or improvise may be trouble, in case they feel more "creative" than the other 49 players. I think those are the main reasons ear playing isn't encouraged much in school.